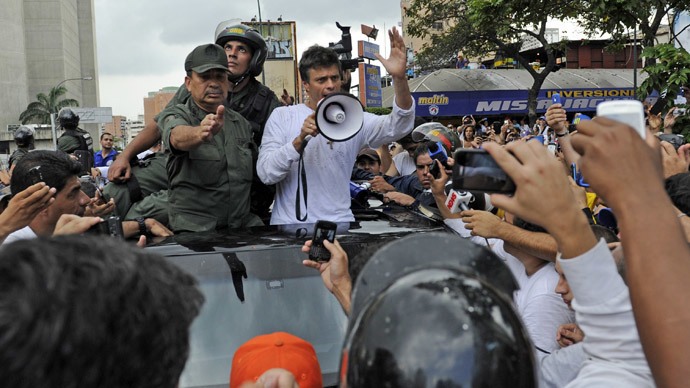 Venezuelan opposition leader Leopoldo Lopez, wanted for inciting violence, has turned himself over to authorities amid a mass rally by his supporters in Caracas in a move he said would “wake up” Venezuelans who want changes in the South American nation. Tens of thousands of opposition supporters blocked the streets of the Venezuelan capital after Lopez’s arrest, reports Reuters citing witnesses. Re-emerging after days of hiding, Lopez addressed some 5,000 of his followers during an anti-government demonstration in the Venezuelan capital on Tuesday, minutes before surrendering to the National Guard. 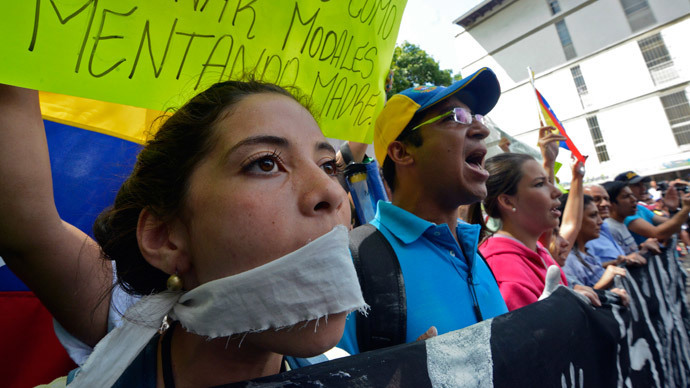 Lopez said he was not afraid of going to prison to defend his beliefs and constitutional right to peacefully protest against President Nicolas Maduro. The crowd was chanting for Lopez not to hand himself over. But the hardline opposition leader announced that if his imprisonment would serve to “wake up Venezuelans” who want to peaceful and democratic changes, his “wretched jailing” would be worth it. After his short speech, Lopez descended from the statue and turned himself in to police. Protesters reportedly surrounded the van that held him, demanding freedom for their leader. Lopez, a 42-year-old US-educated economist, has been heading last week’s protest marches demanding Maduro's resignation and voicing their discontent over a long list of problems including from record-breaking inflation and high crime-rate to corruption and product shortages. Analysts believe that the bulk of the opposition’s support is centered in the struggling middle class, unhappy with government policies that have generally been more favorable to Venezuela’s poor. 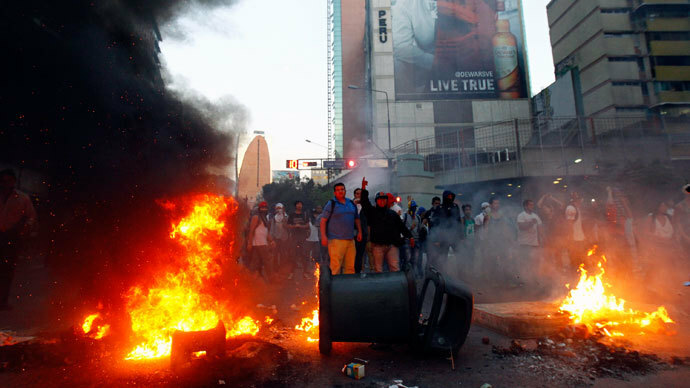 The peaceful gathering in Caracas ended with violent clashes between a group of students and security forces; three people got killed in the unrest. Lopez's supporters claim that the victims were shot by pro-government forces. 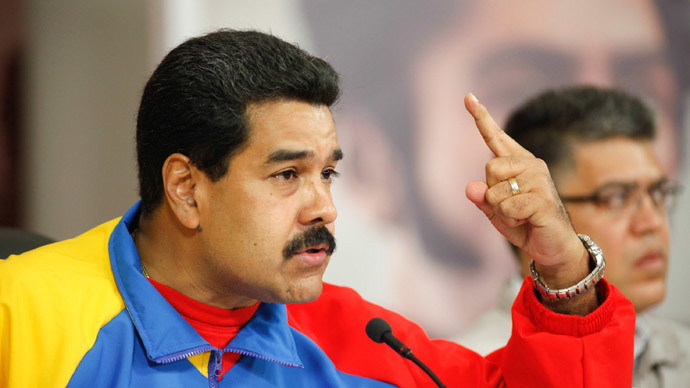 Maduro’s government blamed the violence on Lopez, whom the president accuses of leading a US-backed "fascist" plot to oust the socialist government. Lopez was sought by authorities on an arrest order stemming murder and 'terrorism' to vandalism of public property. The opposition politician, former Mayor of Chacao Municipality of Caracas, claims though that he is being made a scapegoat by a dictatorial government. Tuesday’s opposition rally, as well as a competing pro-government march in central Caracas, comes a day after the Venezuelan government gave three American diplomats 48 hours to leave the country claiming they were supporting opposition plots to overthrow Maduro and meeting with students to incite anti-government sentiment. The diplomatic relationship between the US and Venezuela has been extremely strained for over a decade, since Venezuela’s former leader Hugo Chavez faced an unsuccessful coup attempt in 2002 with strong allegations of US involvement. Expulsions of both country’s top diplomats and consular officers have been commonplace since that time. Meanwhile, Caracas’ received a message of support from Bolivian leader Evo Morales who also suggested that Washington was attempting to stage a coup in Venezuela.